There would be no clinical trials without the patients. They are the wheels that keep a trial moving. Unfortunately, patient recruitment can often be the most difficult part of the clinical trial process. When it comes down to it, successful patient recruitment heavily relies on strong marketing and outreach. Furthermore, the bedrock of good marketing is knowing the audience you want to reach. 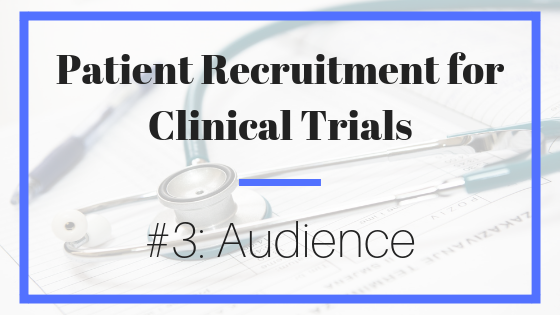 Just like marketers, clinical trial professionals need to define their target audience before they launch any patient recruitment outreach campaigns. Identifying a target audience well before your recruitment efforts begin will help you avoid the trap of overgeneralized and unfocused messaging. Having this foundational base of understanding in regard to your audience will help create a stronger plan to market, advertise, and ultimately enroll a study. The more you know about who you’re trying to reach, the better tailored your marketing strategy will be and the higher the chances of recruitment success. To avoid redundancy, you can develop a general “site persona” that defines the common demographics, pain points and information about your site’s ideal patient population. This persona can then be tailored to each individual study by including additions and deviations from the initial site persona. Where does the audience spend time online? If you want to reach someone, you need to know where to find them. Demographic information comes into play here because it helps give insight into where your audience is most like to spend their time online and get their information – and where you need to meet them. Given what you know about your audience based on your research, choose the outreach avenues that you know will give you the best chance of reaching your ideal participants and tailor your content (and efforts) accordingly. What content will get a response? Are they likely to pay attention to ads? Would they take the time to read blog posts? What keywords would resonate and help spark engagement? Does this person have a relative or caregiver seeking information for them? Accessibility, literacy, free time, and attention span must also to be taken into account. Factors such as these influence one’s ability to consume information and your content needs to reflect that. Understanding your ideal patient population will allow you to more easily move forward with recruitment efforts and set up a successful clinical trial.